Home DevBlog Ground Combat, maybe? I had planned to make the first dev blog about the basic gameplay, but I’ve ultimately decided to do ground combat first. As mentioned in our previous update: April Update: Humongous edition, we we may do ground combat eventually, in an effort to spice up the island gameplay somewhat. In this dev blog I’m going to go over how it would work in greater detail, using the island below as a practical example. 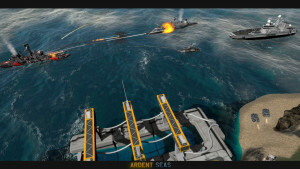 The very first thing you want to do if your goal is to capture an island, is to get rid of any enemy ships nearby. Ships can’t use most of their missiles against ground targets, can use their cannons, and those are still rather devastating, even against tanks. 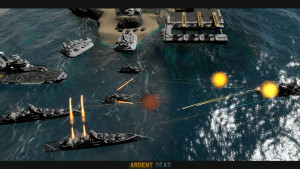 Islands will often have their own defenses, such as anti-ship missile launchers, coastal cannon batteries, surface to air missiles, and also more advanced things, like shield generators and EMP weapons. Your opponent could also have his own vehicles on the island, if he has a war factory there, even replace the ones you’re destroying. Once the area has been cleared, it’s time to bring in the amphibious transports, such as hovercraft, amphibious assault vehicles, and also air transports, like the TDN’s Carryall. 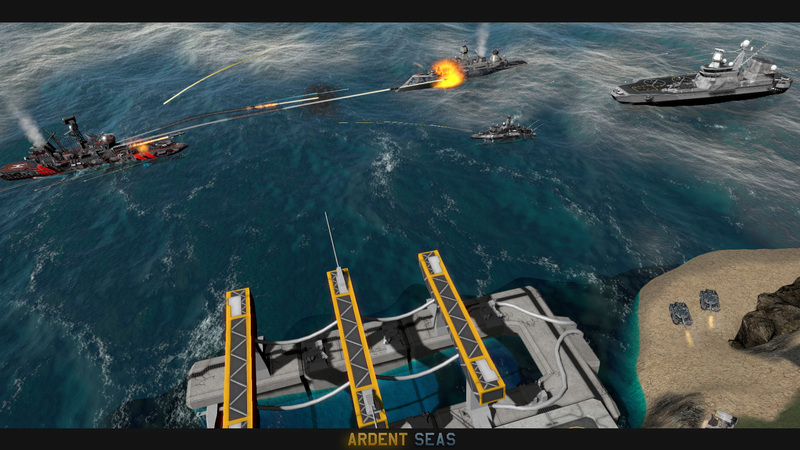 AAVs and Carryalls can be launched by specialized ships. 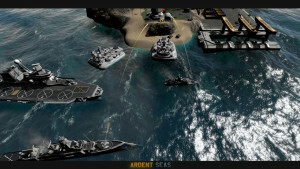 In the case of the TDN, the Helicopter Cruiser and the Supercarrier will both be able to do that, though larger hovercraft are deployed on their own. The Coalition Navy also get a specialized amphibious assault cruiser, and a cargo submarine that can deploy AAVs near the shore. The Ravagers, as so often, do things a little bit differently, involving a lot of orbital drops and unit cannons. More on that, once we’re sure that ground combat will actually go in. There are several vehicle types, with well defined roles planned. Amphibious Assault Vehicles: Slow, heavily armored, but weakly armed vehicles, which can traverse the water and go on land on their own, without requiring transport. These are your best friend early in the game. Main Battle Tank: A well rounded combat unit, with decent armor, firepower and mobility. Best used to destroy structures, MCPs, artillery units, etc. Tank Destroyer: Fast, lightly armored vehicles with a large cannon, devastating against armored targets, such as MBTs. Self-Propelled Anti Aircraft Guns: A SPAAG a day keeps the bombers away. Artillery: Best used to defeat defenses, firing slowly and somewhat inaccurately, but causing heavy damage when they do hit. Mobile Command Post: The most important unit of all, used to capture islands. Special: Every faction gets one special unit, that might be a Mammoth Tank, some sort of stealth unit, etc. Landing Craft: Used to bring regular vehicles, such as Tanks and MCPs onto an island. Merely getting your assault troops onto the island is only the first step, or second, on the way to your new private island. 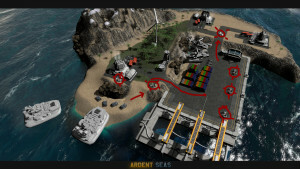 To actually capture this particular island, you’ll first have to get your troops onto its tiny beach, then through the harbor, and into firing range of the Mobile Command Post. 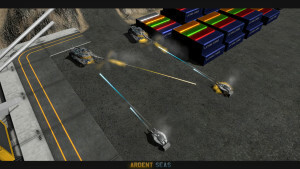 As with vehicles in the case of a war factory present, if there are constructors, the defending player can also build more defenses, which might lead to nasty surprises if you’re not careful. 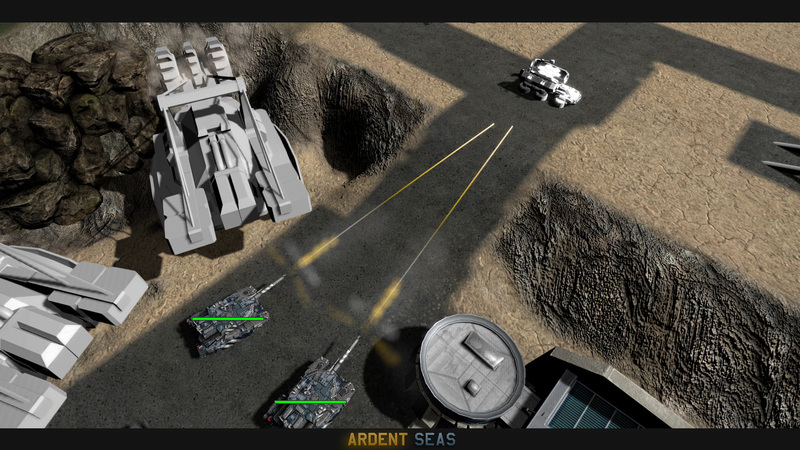 Unlike most other infrastructure, defenses will self destruct as soon as the MCP has been destroyed, but that doesn’t mean rushing it with a large tank battalion will be particularly effective. Despite its flimsy look, the MCP is actually very hard to kill, due to its own active protection systems, and tons of duct tape.